Cêpes, straight from the forest into the pan. 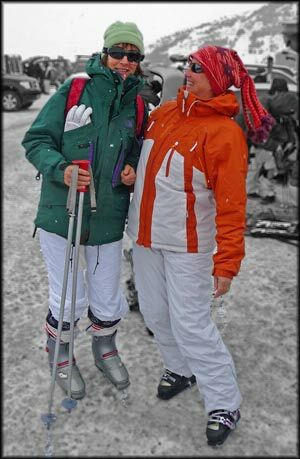 Caroline went skiing for the first time in 15 years. Here she is with Mandy, who is just as mad. But it wasn't all snow. We ate out at lunchtime often. This was taken on 23 December. Caro's outside kitchen was a success to be repeated. Michele's bottle rack doubled as a Christmas tree. 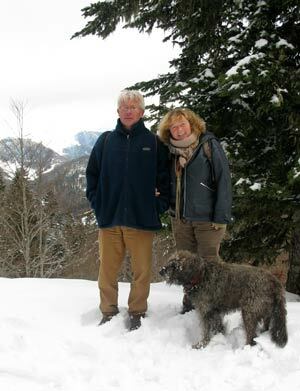 Living so close to the Pyrenees, we can take walks up into the snow within an hour or so. Our friends, Marco and Marike invited us over for dinner and a walk the next day. They live in Aspet, a mountain village off towards Toulouse. We had a great meal in their newly built kitchen (they too are renovating an old place and going great guns). We woke to a crisp, sunny morning. Boots on, dog in the back, we drove up into the mountains. Backpacks filled with a picnic, wine and a few other essentials, we walked up through a wood and onto a clearing, picking up dead wood on the way. Finally our destination came into sight. A refuge. These strategically placed stone buildings are made for mountain travellers. The weather can change very quickly here. 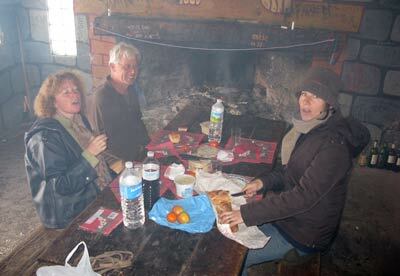 There was a raised deck and a mezzanine for sleeping bags, a large fireplace and a solid oak table and benches. It was very cold inside and we set about lighting the damp wood. It took a while and it smoked a lot, but we managed to get the place comfortable. Spreading our goodies out on the table, we stuck in to ham, paté, cheese and some rather chilled red wine. The weather closed in and we descended to the protection of the trees, where the wind was less fierce. A bracing day out and some fabulous views. Merci M&M! Ernest popped by one day for a chat. 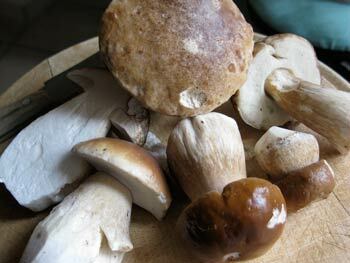 He'd been out early that morning, looking for mushrooms and had found several kilos of cêpes. These can be enormous, very fleshy and fabulous when grilled or fried. We sliced them up and had them in an omelette (from Ernest's eggs) for lunch. MMMmmmmm! Perry spent a lot of time at the Trie rugby club (FCT), working at the bar on match days and helping prepare the dinner for the players on training evenings. It has given us some more social contacts and more hands to shake each time we go to town. He also helped with the Christmas market, serving bacon sandwiches and hot, mulled wine. On that day, he served the Canadell family who happen to own the biggest saw mill and wine barrel company in the south west. Business cards were exchanged and Perry has made brochures and logos for them and is now developing a website. That's what getting your face out there can do for you. It's great to have more French clients on the portfolio too. Meanwhile, Caroline was suffering with a flu that went on for weeks. She was low on energy, high on tissue usage. It meant that she missed several big dinners, exhibition openings and nights out. Not feeling the full Monty, as well as not wanting to infect people just before Christmas she stayed home. Perry amazingly stayed bug free, right up until a day or so before New Year. Sadly, he always loses his taste, so the delicious dishes and delights were wasted on him. 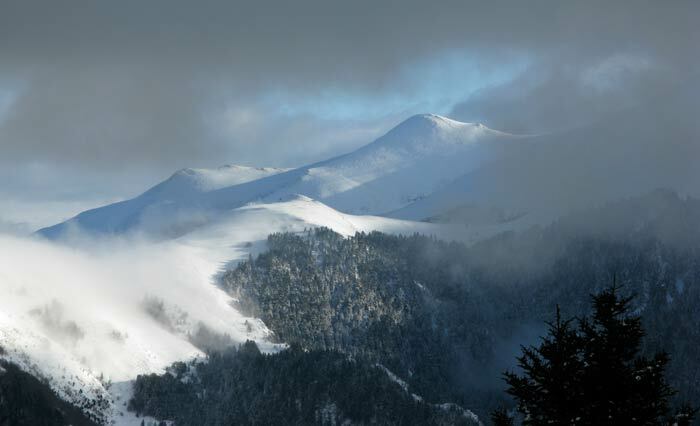 Caroline has been chomping at the bit for ages, each time she sees the snow piling up on the Pyrenees. This time she decided to get geared up and get her old stuff from the mothballs and go for it. And she still fitted her salapets! Caro went three times with our friends Mandy and Jonathan and had a ball. Only fell once with no broken bones. 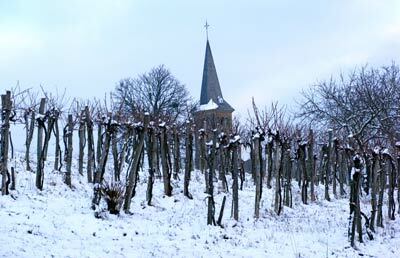 The season started with metres of snow and carried on until the end of April. It was Caroline's first time on skis for 15 years. Perry thinks that she won't let so much time pass before she gets onto a ski lift again. We were invited by friends Abdel and Michele to join them for a world party on New Year's Eve. Each guest they invited had to bring a dish from their country. There was a buffet of dishes from France, Spain, Armenia, Algeria, Sweden, Holland, England, Italy, Germany and many more we can't remember. Caroline came with oliebollen and I made a big trifle. 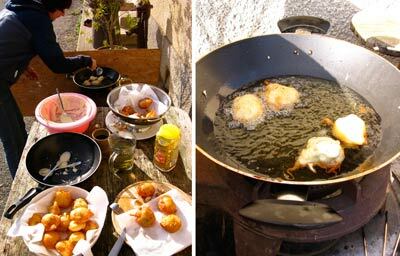 We borrowed a gas burner and made the oliebollen outside, since the smell of frying fat would linger in the house for days if we did it in the kitchen. It was Caro's first attempt at making them and they were a great success. 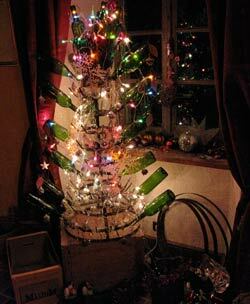 Michele decorated the house beautifully for the evening and used an old wine bottle stand as a Christmas tree. Perfect for the setting. We slept over and faced the new year with the left overs from the night before and some strong coffee. A happy, peaceful and healthy 2009 to us all.